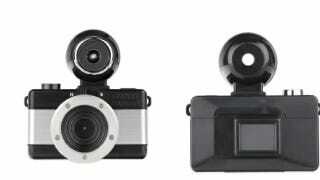 The new Fisheye Baby 110 recalls the spy cameras from Cold War thrillers. Except instead of using them to perpetrate acts of espionage, you'll use them to take wonderful, lo-fi photos from last night's party. The Fisheye Baby 110 is a Lomo camera that takes photos similar to Lomography's 35mm Fisheye camera but crams it down into a bite-size package by using smaller format 110 film. It's seriously tiny, and though Lomography doesn't provide size and weight specs, you can tell from the photos that it's definitely pocketable. That's a smart design choice on Lomography's part. For a few years, Lomo cameras have been making a comeback. People love the saturated colors and artsy feel of the photos. But they're still film cameras and in a post-Instagram world, well, maybe there's just not a need to lug around a film camera to get those results?